To celebrate access and inclusion for people with disabilities, The Chicago Lighthouse invited Commissioner Karen Tamley of the Mayor’s Office for People with Disabilities to comment on the progress that has been made, and the challenges that remain in ensuring full equality and independence for members of the disabled community. Commissioner Tamley notes the role The Lighthouse has played in unveiling our Lighthouse on The Mag Mile Public Art Display this summer, which showcases the contributions that individuals with disabilities can make if given the chance to do so. We encourage Chicago area employers to visit our website, https://chicagolighthouse.org/programs-services/employment-training/ to see how they can utilize the talents of individuals who are blind, visually impaired, disabled and Veterans. The Chicago Lighthouse employment and training programs provide support to clients in all aspects of their career. Twenty-eight years ago this month, the Americans with Disabilities Act, one of the most sweeping civil rights laws in the nation was signed into law. It was hard to fathom at the time how the stroke of President George H.W.’s pen could so significantly change the lives of millions of Americans with disabilities. But it did. People with disabilities can now move about and participate in their communities like never before, accessing public transportation, recreation, and public accommodations like stores, restaurants and movie theaters. Chicago is widely regarded as one of the world's friendliest cities for people with disabilities. Despite significant progress, our community still faces enormous barriers to gaining employment. In Illinois, only 25% of people with disabilities are employed as compared to 75% for those without disabilities. Our community faces a poverty rate two times higher than those without disabilities. 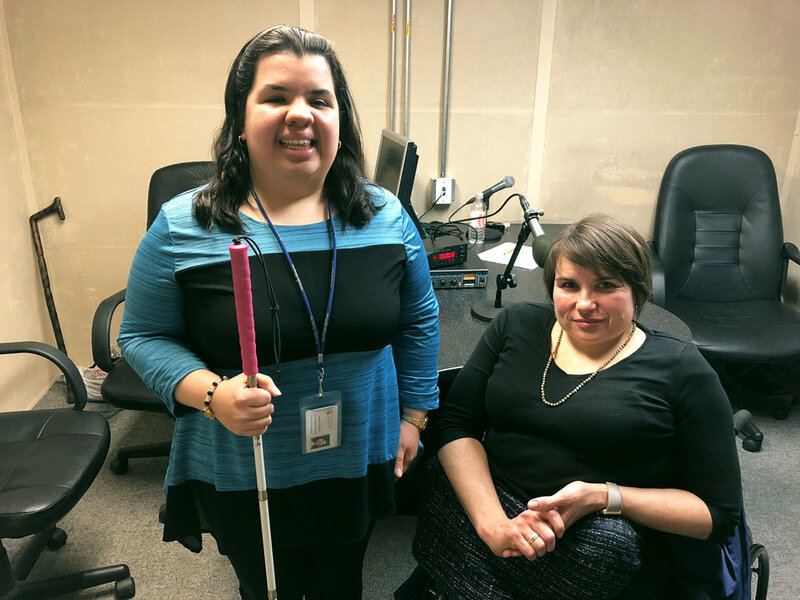 Karen Tamley, the Commissioner for the Chicago Mayor’s Office for People with Disabilities (right) pictured inside of the CRIS Chicago Studio at The Chicago Lighthouse after an interview with Associate Producer Sandy Murillo (left). The good news is that increasingly, employers are taking active steps to diversify their workforces by recruiting, hiring and including employees with disabilities. People with disabilities are beginning to be recognized as an untapped talent pool that can meet employers needs particularly in this strong economy and tightening labor market. It is critical to the advancement of our community that we continue to shatter outdated stereotypes and misconceptions that have for too long, kept people with disabilities out of the mainstream. The Chicago Lighthouse is doing just that. Last month they launched a display of fiberglass lighthouses along Michigan Avenue that are individually hand painted by artists with disabilities. They are not just beautiful pieces of artwork but public displays of the talents and the stories of a community that is too often unrecognized. Each lighthouse is storytelling through art that has the power to educate, shape public opinion and ignite a social change that can move our community closer to the ADA’s promise of equality, opportunity and independence. I hope you will take the time to stroll Michigan Avenue to see it for yourself. This lighthouse titled "Feeling the Beauty in Every Face is not Blind" by Peter J. Bucks features portraits of many employees of The Chicago Lighthouse who are blind or visually impaired. Let's Celebrate and Support the Talents and Independence of People with Disabilities! As we celebrate the Fourth of July, we also celebrate and support the independence and talents of people with disabilities. Carlos Hranicka and Maria H. Franco are two artists with disabilities that participated in Lighthouses on The Mag Mile with the group The Blind Weavers of Friedman Place. Both of them shared with us their thoughts on what independence means to them. We urge you to reflect on their comments and ask yourself the question: What can I do to help promote access and inclusion for people with disabilities? Twelve artists with The Blind Weavers of Friedman Place worked together to create the sculpture titled Our Woven Lighthouse that is currently on display as part of Lighthouses on The Mag Mile, a public art display celebrating access and inclusion for people with disabilities. Independence means that I am able to do things perhaps a little bit slow but to the best of my ability and to be sure that they are done correctly. It also means that I am able to go out to certain neighborhoods or places without worrying about getting hurt while traveling with a white cane. It also means that I am able to do the things that I know how to do besides cooking on my own, like doing laundry, cleaning my own apartment, and to help others be as independent as they can and help with things that I can do that they need help with. Many employees of The Chicago Lighthouse use guide dogs to travel safely and independently. Independence means freedom of certain things – not everything, because certain things I need help with – such as doing what I know how to do properly and promptly, to the best of my ability. Being able to do the things that I want to do whenever I want to do them. To me the definition of independence means what I stated above. Other people may have different definitions, but this is mine. 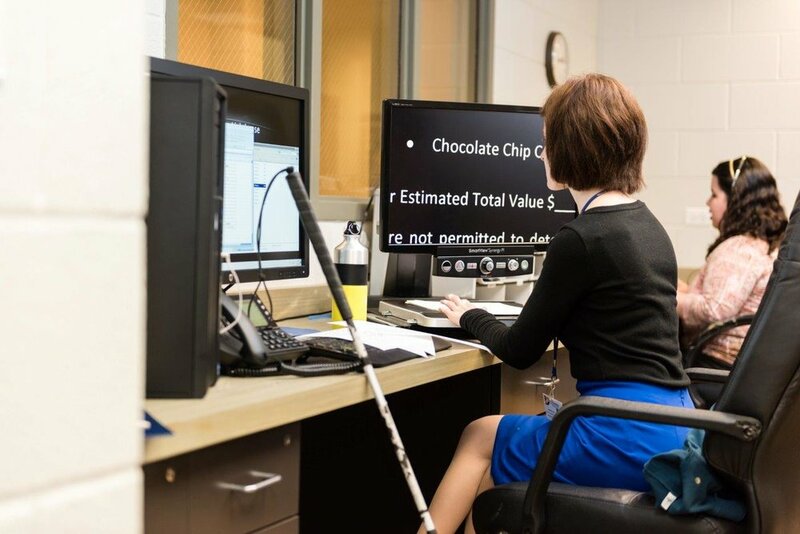 Assistive technology offered at The Chicago Lighthouse helps people who are blind and visually impaired work efficiently. Independence means cleaning, cooking, meeting challenges that are beyond you. It means making things that help others. It means strengthening others. It means creativity. It means teaching others. Giving to others, besides yourself. Cane travel. Or Dog travel. Going beyond what it means to be blind – being an eye for others. Seeing what others don’t see. Being a good writer. Being a winner and not a quitter. One that never gives up. Never doubts. Independence is discipline. Independence is being a driver of your destiny and a strength for others destiny, and to be there for others who cannot be there for themselves. We wish all of you a very happy Independence Day holiday! As a birthday wish for Helen, please share your wish for access and inclusion for people with disabilities in the comment section below! A photograph of Helen Keller appears on one of 51 lighthouse sculptures that are part of Lighthouses on The Mag Mile celebrating access and inclusion for people with disabilities. This piece is titled "Lovely Helen" by artist Jennifer Hiser of 4Everly Adorned. She was literally the very first beacon who championed the causes of access and inclusion for people with disabilities. Today (June 27) marks what would have been the 138th birthday of Helen Keller, respected around the world as an educator, journalist, humanitarian and tireless advocate for the disabled community. This year also marks the 50th anniversary (1968) of her passing. Though both deaf and blind, Ms. Keller never let her disabilities deter her from pursuing her dreams and living a full and rich life. In the process, she inspired millions around the world. In her lifetime, Helen Keller never let any obstacles stop her from being a crusader for people with disabilities. The Chicago Lighthouse is very proud to have an association with Ms. Keller. Back in 1955, she helped dedicate our headquarters building at 1850 W. Roosevelt Road on Chicago’s near west side. On that historic occasion, which had the Governor of Illinois and Mayor of Chicago in attendance, she also dedicated The Lighthouse’s low vision clinic, one of the oldest and most respected in the United States. “There were about 400 people there who gave her a standing ovation…tears were flowing because it was just a memorable event,” says an individual of Helen Keller’s speech during her visit to The Chicago Lighthouse in 1955. 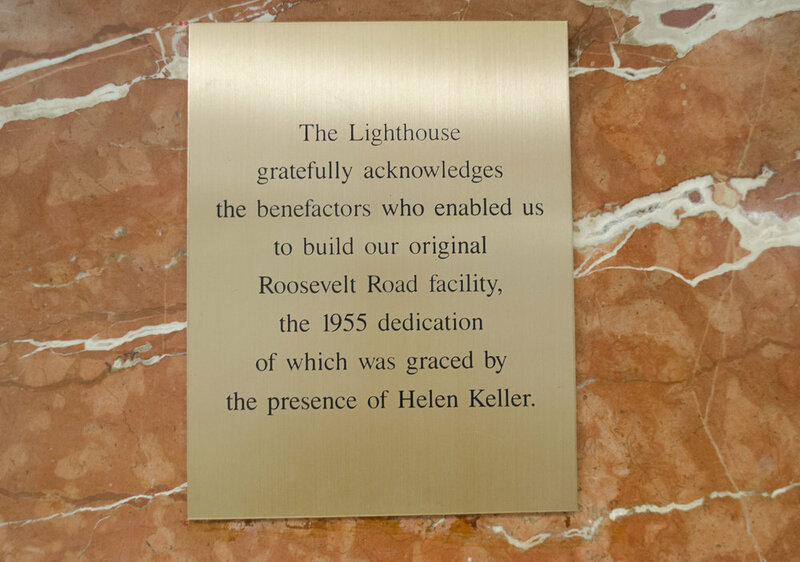 A plaque on a wall in The Chicago Lighthouse commemorates Helen Keller's visit and dedication to the facility in 1955. It is fitting that Ms. Keller’s birthday coincides with the running of our world-class Lighthouses on The Mag Mile Public Art Display, which celebrates access and inclusion for people with disabilities. Throughout her life, she embodied all the values that the beautiful lighthouse sculptures represent. 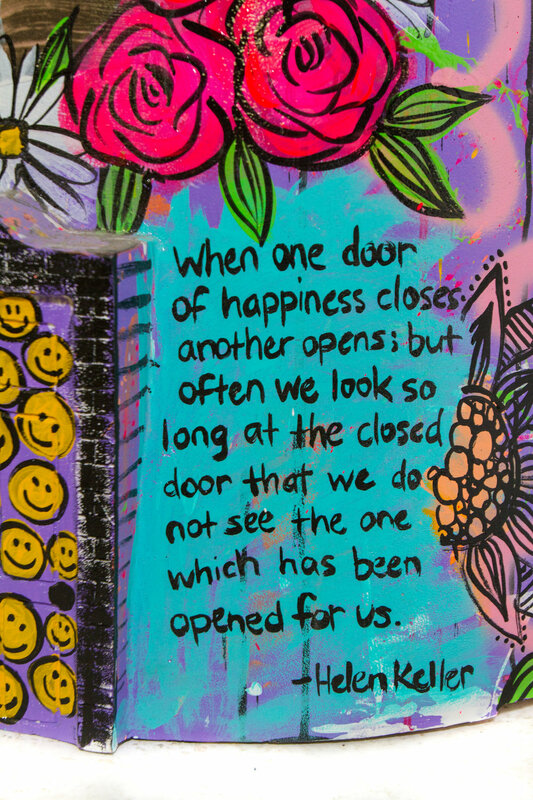 Helen Keller embraced life to the fullest. She traveled throughout the world and was active in many communities. This quote is painted on another lighthouse sculpture as part of Lighthouses on The Mag Mile celebrating access and inclusion for people with disabilities. This lighthouse is by artist Carrie Carlson. We invite you, your family, friends and colleagues to visit all the lighthouses that are on display through August 11. As a birthday wish for Helen, please post your wish for access and inclusion for people with disabilities below. To share your wish, click on the blog article to activate the comment box and write your wish. for updates from The Chicago Lighthouse.